I am an illustrator and have been working on some of my own design film posters which I would like to sell. The posters are obviously unofficial designs, bear no resemblence to the original posters and do not use any of the original film poster artworks or photography/stills etc. 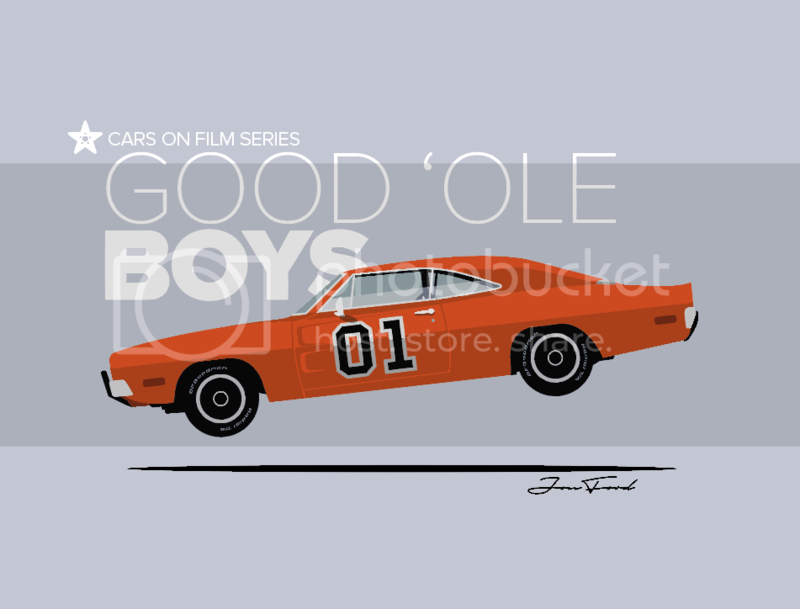 What they all feature, however, are the cars and motor vehicles associated with these films. For instance: my poster for the Warner Bros movie 'Bullitt' is represented by The Ford Mustang and Dodge Charger locked in a dynamic battle from a scene you would recognise if you were familiar with the film. The illustrations are based upon movie stills but quite stylized, graphical interperetations redrawn in my own style. 1. Any trademarks owned by the car manufacturers on using names, likenesses of their vehicles or their logos represented. Badges for instance. 2. Any infringement on the image rights of the stills I have based the artwork on - either photographer or film company. 3. Any infringement by using the film title. It will not be in any typeface used by the film. For example 'Bullitt' will be written in helvetica at the top. I don't intend to use actors/director's/film company names or likenesses etc. I will try and set your mind at rest about some of the general points you raise in your post. However there are some difficulties with the specific Bullitt poster. 1. While the names and badges of iconic (and even more mundane) cars will usually be protected by trade mark law, especially at the time when and in the territories where the vehicles are on the market, the protection afforded to the trade marks will be limited to specific categories of goods and services. Unless 'posters' or more generically, 'artworks' are among the classes which have been registered, you do not directly infringe a trade mark by including it in one of your works. What's more, each trade mark registration has a fairly short lifetime (25 years in the UK or EU, and 20 years in the USA), after which it must be renewed for a similar period. If during the period of registration the mark is not used continuously for a period of 5 years in the classes for which it has been registered, it can be challenged. So it is frequently the case that once the goods or services for which the mark was registered are no longer being sold, the registration is allowed to lapse by the owner since there is no longer the need for the same level of protection. Of course this doesn't apply in all cases, and many registrations are maintained in order just to deny the mark to some other manufacturer of similar goods who might want to cash in on the reputation of the earlier product etc. So in your particular case, the Ford Motor Company have at least 10 separate current registrations of EU-wide trade marks for 'Ford Mustang' (here's a typical one), but none of them cover anything remotely like film posters or artwork of the type you have described. As far as Chrysler is concerned, they did once hold a registered mark for 'Charger' but that has now lapsed, and the only extant registration (at least, for cars) is one owned by a company named FCA in the USA, but this is only in connection with car parts. On that basis the only objection either company could raise would be one of passing-off, but since nothing you are proposing to do could be seen as damaging to the reputation or the goodwill in either vehicle (quite the opposite in fact), then that sort of legal action would have little chance of success. 2. A still from a film is covered by the copyright in the overall movie (see section 17(4) of the Copyright, Designs and Patents Act 1988), but using the still as your inspiration takes you some distance from actual copying, and as you mention that you have stylized your version I think this takes you even further from danger. Under the US doctrine of Fair Use, I think you would be entirely safe, but UK law would require an examination of whether a substantial part of the original work had been taken. Unfortunately the way substantiality is judged is based on qualitative issues such as the degree to which the taken part represents the essence or spirit of the original work, and on that basis of course, the car chase is both emblematic and quickly identifiable with the film, so that doesn't work in your favour. However all is not lost. We now have a new exception to copyright for 'quotation', and it is quite clear from the wording of the Statutory Instrument that this is not limited just to quoting text, so I think there is a very good chance that your intended use of the still would be seen as quotation within a work which re-interprets the scene. We don't have any actual court cases based on the quotation exception yet (it's only been available for a little over a year) but I think it is perfectly possible that this is exactly the sort of use Parliament had in mind when it brought in the new legislation. 3. Film titles will almost never be entitled to copyright protection because they lack sufficient originality as works of literature. There is a hypothetical case that some quite long and quirky film title (The Cook, the Thief, His Wife & Her Lover) might just qualify, but in general the courts have always ruled against booktitles alone having copyright, and so I don't think you need to be concerned about that aspect. To get round this lack of protection through copyright, many film titles are registered as trade marks. However in the case of Bullitt, this doesn't seem to have occurred in the UK. But someone who appears to be unconnected with Warner Bros has registered the mark, and unfortunately for you, it is registered for, amongst other things, 'audio-video promotional materials' and so your poster would almost certainly infringe this mark if you use the word Bullitt, and there is any way in which the use of your posters could be construed as in the course of trade (ie you want to sell them). I haven't been able to find out much about the mark's registered owner, Christopher Richard Pring, other than that he is the director of a limited company called Bullitt Ltd, and the firm's activities concern 'Specialised Design'. Maybe he designs film posters! So as you can see there will generally be no problem with you making new versions of posters for old films, so long as you do a little homework on things like registered trade marks, and where you identify a possible issue, it may be worth contacting the mark's owner and seeing if you can get permission to use it. Thankyou Andy3! That certainly has put my mind at rest. What an amazingly thorough answer. So to summarise, I have little to worry about, apart from the potential of the holder of the registered trade mark Bullitt. However, the link you kindly posted from the IPO, states that he has the registered 'trademark'. Would this mean the logo (or mark) for Bullitt, or the word (in type form)? Or both? How can one tell? I'm assuming as no mark appears in the case details, he owns the word? In that particular case it's just the word Bullitt which has been registered. If a trade mark consists of an image or a text mark in a specific font there be an illustration of what has been registered, as with the Ford Mustang mark I linked to. I've been doing some thinking and some digging and it now seems futile to run with my range of posters with the TV / film title theme. 'Bullitt' was one case, but out of the others I was considering, a high proportion of them are registered trademarks too. A lot of Warner Bros films for instance. Am I right to assume this should cause me no problems? 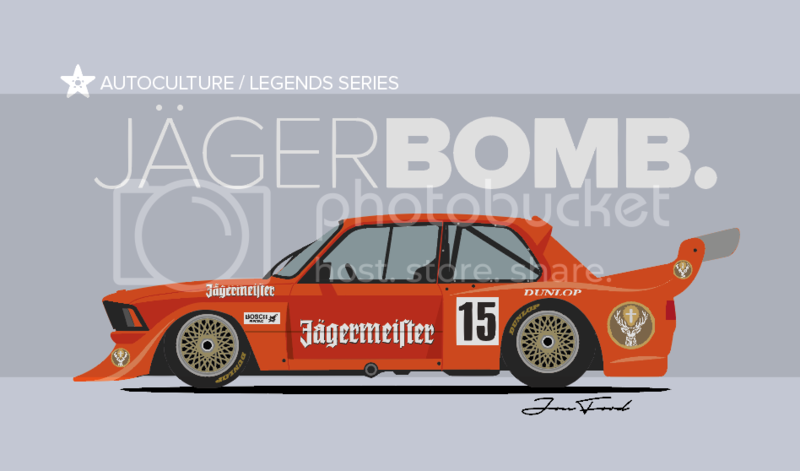 JÃ¤gerbomb is trademark under several classes, but I assume selling this design as a T-shirt is permissable, as it is not registered in class 25. However, I want to sell it as a poster too and it is registered in class 16 - Paper, cardboard and goods made from these materials, including printed matter etc. 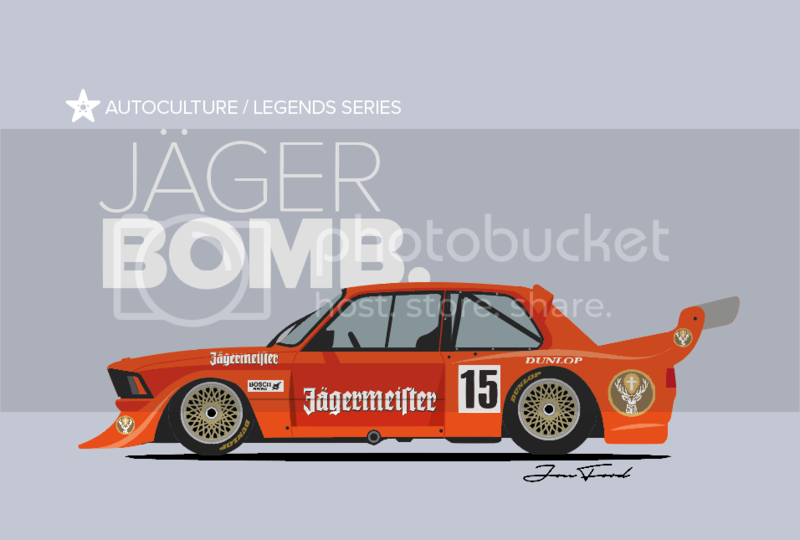 So, would splitting the registered word, to JÃ¤ger Bomb avoid the issue? I realise 'JÃ¤ger' is registrered in class 33 - Alcoholic beverages with the exception of beer, but this shouldn't concern me should it? We have now moved squarely into trade mark land, and that isn't what this forum is about, so I will make this my final answer on this thread. In general what you want to do, using the cars and various catchphrases from the films/TV programmes, should be fine. As you note, you still need to be careful with any individual trade marks which may appear on the cars, but given that most of them appear (on the real cars anyway) for the purposes of advertising, you are unlikely to get much flak from the sponsors, unless of course you treat their branding in a derogatory way. On the specific matter of the JÃ¤gerbomb mark, and the fact it is registered in class 16, it might be sensible to get permission for what you want to do. And splitting the word into two really wouldn't make much difference because under the various categories of infringement, this would fall into the 'similar mark - same class' category (see section 10(2)(b) of the Trade Marks Act 1994). It is worth saying here that under trade mark law, the emphasis is slightly different when it come to assessing infringement. The law tries to prevent someone, without a reasonable excuse, from dealing in goods under a registered mark of another person, or offering goods under the mark or something very similar. As long as you refrain from using the trade mark in the title of your posters when you advertise them, that should deflect the majority of potential infringement claims, since merely having the word or words of a mark on the side of a vehicle in a picture is quite some way from 'selling under the mark'. For example, although this doesn't apply to your case, it is perfectly permissible to use someone else's trade mark for the purposes of comparative advertising, where it quite clear that you are promoting your own goods, not those sold under the other mark. For you, the main problem arises when the trade mark owner also indulges in licensing his mark(s) to third parties for various merchandising projects. In this kind of case, the owner of the mark may be contractually obliged to take steps to protect the mark on behalf of the licensees, even though the owner himself may have no objection to the activity which might potentially infringe, because it doesn't affect the market for his own goods. We see this most clearly with the film industry and all the spin-off merchandise. Thank you very much. Your advice is much appreciated.